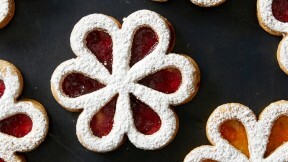 Make Martha Stewart's Linzer Flower Cookies from the Cookies of Austria, Germany & Switzerland episode of Martha Bakes. Lightly sift confectioners’ sugar over cookies with cutout petals. Spread a heaping teaspoon of jam on each solid cookie; carefully sandwich with sugared cookies.